Some of the best close-up looks at birds throughout the year are at birds coming to a winter feeder; and finches are among the showiest and most interesting birds to appear. These sparrow to robin-sized birds have strong bills adapted to extract and crack open the seeds of conifer trees. Winter is the best season to look for finches because most don’t migrate south looking for insects in warmer areas, but instead wander across the forest belts in search of cone crops. If they find our feeders they will drop in to eat our seed offerings to the delight of those who see them. Adult male finches are quite colourful and fairly easy to identify using a field guide, but the females and young males tend to be duller and brown or grey. At first glance, they may look like sparrows. The shape of the tip of the tail is a quick way to sort them out. The middle tail feathers on finches are shorter than the outer ones giving the tip of the tail a notched or forked look, whereas sparrows’ tail feathers are mostly the same length leading to squared or rounded tips to the tail. Also, sparrows feed mostly on the ground below feeders, while finches feed in trees. The Ontario Federation of Ornithologists (OFO) website is a great source of information on Ontario birds. It has photos of many rare birds of Ontario including an excellent gallery of finch photos. These pictures can be a great help to identify that interesting bird coming to your feeder or chattering away in the nearby pine tree. The finch photos are at http://www.ofo.ca/photoalbums/archive/Finches/index.html. Jim Gardner, longtime Parry Sound resident and member of the Parry Sound Nature Club, has organized the Parry Sound Christmas bird counts since 1993. Much of the data in the Christmas bird count is from feeder watchers. His summary of the number of years each finch species was seen over 16 years of observation, is tabulated below. The data shows, for instance, that Goldfinches were seen each of the 16 years of counts, while Pine Grosbeaks were seen 11 of the 16 years of counts, and so on. The two Crossbill species and Hoary Redpoll are the rarest. If you would like to participate in the count, look for announcements in the Parry Sound North Star. Finches nest in the belt of forest that runs across Canada from coast to coast. The more northern boreal forest is comprised mainly of spruce trees. South of this is mixed forest, similar to that of our region, with evergreen conifers spruce, pine, and hemlock, interspersed with deciduous trees. The birds feed in winter on seeds in the cones of the evergreens. In the warmer months they will also eat caterpillars and often will nest in an area of forest that has a Spruce Budworm outbreak guaranteeing plenty of food for the nestlings. If there is a bumper crop of seeds where they nested then there is no need to look elsewhere and they will spend the winter there as well. However, if the crop is sparse they start searching other forest areas to the east, west, or south. Occasionally there are large-scale crop failures causing almost every finch to leave an area. This could mean almost all of them will leave the western provinces and fl y east. Some may roam as far as the southern U.S. on occasion. If these wandering birds find a localized crop of seeds they will pause to eat it all, then move on. Seed crops in the forests vary from year to year, and a study of seeds available across the Canadian forest belt can indicate whether this might be a good winter or poor winter for these nomadic species to appear. A prediction as to how good a year it will be is posted every fall on the OFO website. This year’s prediction is posted at http://www.jeaniron.ca/2011/fi nchforecast.htm. It states that there is a bumper crop of seeds in the boreal forest this year, so the finches are not expected to appear here this winter in great numbers. Most years there are usually scattered individuals or small flocks wandering around. A good place to look for them is in Algonquin Park at the visitor center feeding station where there are often Pine Siskins or Purple Finches. But they also show up in our area coming to feeders for niger or sunflower seed. Sometimes they will drop in for just a day or two and then leave. Sometimes they will stay all winter. Anyone lucky enough to have Evening Grosbeaks, one of the showiest of the finches, (spectacular black, white, and yellow), wolfing-down sunflower seeds with their huge bills, will not hesitate to buy that extra bag of seed just to keep the birds coming. It is not just seed feeders that attract finches in winter, any trees or shrubs that still have fruit or berries will also attract them. It is worth checking Mountain Ash trees, that still have a good crop of berries as both Pine and Evening Grosbeaks love them. Evening Grosbeaks eat wild cherries that grow along forest edges and logged areas and their bills are strong enough to crack the cherry stones. In the winter they will eat small crab apples and hawthorn fruits. The most common finch in the area is the Goldfinch. In spring breeding plumage the small bright yellow bird with black wings is unmistakable and is sometimes referred to as a wild canary. In the winter both the male and female are a drab gray with only a hint of yellow, but they still have black wings with a yellowish wing bar. They nest in open shrubby areas late in the summer, timed perhaps to take advantage of the ripening of thistle seeds, a favourite food. In winter most move south, but obviously there are lots of stragglers since they occur here regularly in the winter. They, along with Pine Siskins, like the small niger seed and are comfortable hanging up-side-down to feed at niger feeders. In spite of their name, the colourful males of the beautiful Purple Finch are more red than purple. The females and all juveniles of the year are brown and streaked. The young males don’t get their red colour until their second fall. In the winter most roam south of us into the U.S., but usually a few linger and come to feeders. Later in the season they start to sing their wonderful cheerful warbling song. Those who live in town should be on the lookout for House Finches. They look like Purple Finches except they are a little smaller and slimmer. The males have more restricted red colour and the females and young are paler than Purple Finches and have plain face patterns. The historic range of these birds is west of the Rocky Mountains but a few cage birds were released on Long Island, NY, in 1940 and since have spread over much of eastern North America. I remember driving to Niagara-on-the-Lake in 1978 to see the first House Finches found nesting in Ontario. They are non-migratory, spending their whole life nesting and wintering in urban settings around homes, and readily come to feeders. In the last Ontario Breeding Bird Atlas of 2001-2005, during which volunteers scoured the province recording all the nesting birds, House Finches were found in the town of Parry Sound, and also in a few areas north to North Bay. Unfortunately, House Finches have suffered from an eye disease epidemic that has greatly reduced their population. They haven’t been recorded on the Parry Sound Christmas Count for the last 10 years. Redpolls nest north of the main forest belt in open areas with stunted spruce, and birch trees. In Ontario most Common Redpolls nest close to James Bay. The Hoary Redpolls range further north onto tundra and are circumpolar. In, winter, mainly in alternate years, Common Redpolls roam south looking for their favourite food, the seeds of birches and alders. Common Redpolls are a fairy regular winter visitor in Parry Sound. Hoarys are rare. Individual Hoary Redpolls join flocks of Common Redpolls and it is always a challenge to try to find a Hoary in with all the Common Redpolls that might be coming to a feeder. The Hoary Redpoll should stand out as paler or frostier than the Common. The rare Red Crossbills and White-winged Crossbills are both exciting birds to find. They have unusual bills that cross at the tip, an adaptation that helps them to extract seeds from the cones of spruce or pine. They are particularly nomadic and are known for mass movements in search of food, but it may be only one year in 20 that they appear in our area. If they find a local crop of seeds they will stay around until they have exhausted it and then move on. Both Crossbill species have been known to nest at any time of year, including the winter, in areas of particularly good seed crops. 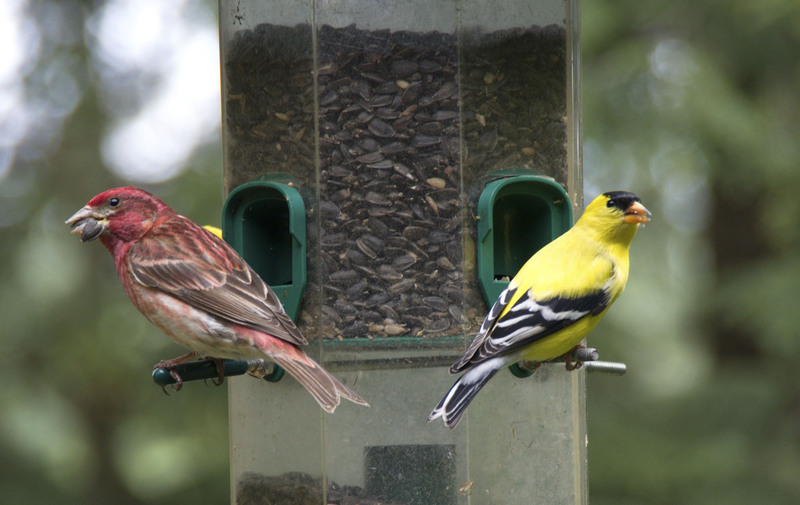 Even if no finches visit through the winter, try keeping your feeder going into the spring. There is a good chance of a visit from Goldfinches, Purple Finches, and possibly Evening Grosbeaks since they are documented nesters in our region. They do like sunflower seeds and if they discover your feeder they may even choose to nest close by.